The American religious landscape is undergoing a dramatic transformation. White Christians, once the dominant religious group in the U.S., now account for fewer than half of all adults living in the country. Today, fewer than half of all states are majority white Christian. As recently as 2007, 39 states had majority white Christian populations. 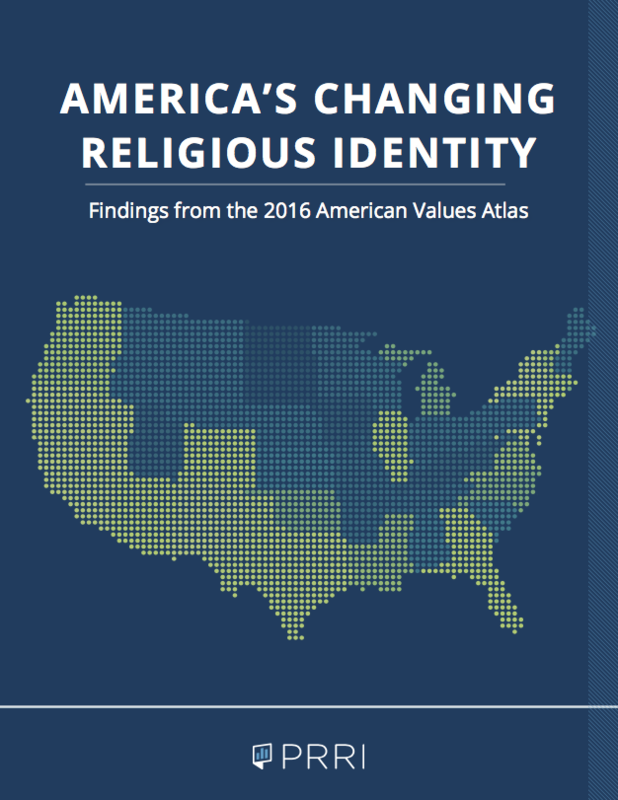 These are two of the major findings from this report, which is based on findings from PRRI’s 2016 American Values Atlas, the single largest survey of American religious and denominational identity ever conducted. This landmark report is based on a sample of more than 101,000 Americans from all 50 states and includes detailed information about their religious affiliation, denominational ties, political affiliation, and other important demographic attributes. Non-Christian religious groups are growing, but they still represent less than one in ten Americans combined. Jewish Americans constitute 2% of the public while Muslims, Buddhists, and Hindus each constitute only 1% of the public. All other non-Christian religions constitute an additional 1%. America’s youngest religious groups are all non-Christian. Muslims, Hindus, and Buddhists are all far younger than white Christian groups. At least one-third of Muslims (42%), Hindus (36%), and Buddhists (35%) are under the age of 30. Roughly one-third (34%) of religiously unaffiliated Americans are also under 30. In contrast, white Christian groups are aging. Slightly more than one in ten white Catholics (11%), white evangelical Protestants (11%), and white mainline Protestants (14%) are under 30. Approximately six in ten white evangelical Protestants (62%), white Catholics (62%), and white mainline Protestants (59%) are at least 50 years old. The Catholic Church is experiencing an ethnic transformation. Twenty-five years ago, nearly nine in ten (87%) Catholics were white, non-Hispanic, compared to 55% today. Fewer than four in ten (36%) Catholics under the age of 30 are white, non-Hispanic; 52% are Hispanic. The American religious landscape has undergone dramatic changes in the last decade and is more diverse today than at any time since modern sociological measurements began. Fifteen percent of Americans are nonwhite Protestants, including black Protestants (8%), Hispanic Protestants (4%), and Asian, mixed-race, and other race Protestants (3%). Seven percent of the public is Hispanic Catholic. Non-Christian religious groups constitute less than one in ten Americans. Muslims, Buddhists, and Hindus are each roughly one percent of the population. Jewish Americans account for two percent of the public. No religious group is larger than those who are unaffiliated from religion. Nearly one in four (24%) Americans are now religiously unaffiliated. The religious landscape in the U.S. is highly stratified by generation. Nearly two-thirds of seniors (age 65 or older) identify as white and Christian: White evangelical Protestant (26%), white mainline Protestant (19%), or white Catholic (16%). Conversely, only about one-quarter of young adults (age 18-29) belong to a white Christian tradition, including white evangelical Protestant (8%), white mainline Protestant (8%), or white Catholic (6%). Young adults are more than three times as likely as seniors to identify as religiously unaffiliated (38% vs. 12%, respectively). There is substantial variation in religious identity between the four regions of the United States. Collectively, white evangelical Protestants are twice as large in the South (22%) and Midwest (20%) as they are in the Northeast (8%). Twelve percent of residents in the West are white evangelical Protestant. In contrast, Catholics represent a much larger share of Northeastern residents. Roughly three in ten (29%) residents of the Northeast identify as Catholic, compared to about one in five Westerners (21%), Midwesterners (19%), and Southerners (17%). The religiously unaffiliated represent a larger share of the population in the West (29%) than in the Northeast (24%), Midwest (23%), or South (20%). Notably, there is significant racial and ethnic variation among Catholics by region. White Catholics outnumber Hispanic Catholics by a wide margin in the Northeast (20% vs. 7%, respectively) and Midwest (15% vs. 3%, respectively). However, in the South, residents are about as likely to identify as white Catholic (8%) as they are to identify as Hispanic Catholic (7%); and in the West, Hispanic Catholics (12%) outnumber white Catholics (7%). There are substantial differences in the religious profiles of the 50 states, although they follow regional patterns. There are 20 states in which no religious group comprises a greater share of residents than the religiously unaffiliated. These states tend to be more concentrated in the Western U.S., although they include a couple of New England states, as well. More than four in ten (41%) residents of Vermont and approximately one-third of Americans in Oregon (36%), Washington (35%), Hawaii (34%), Colorado (33%), and New Hampshire (33%) are religiously unaffiliated. In 11 states, many of which are clustered in the Northeast, no religious group outnumbers Catholics. No state has a higher concentration of Catholics than Rhode Island (41%), followed by Massachusetts (34%), New Jersey (34%), New York (31%), and Connecticut (31%). In 13 states, no religious group comprises a larger share of residents than white evangelical Protestants. Unsurprisingly, most of these states can be found in the South. At least one-third of the residents in the following states are white evangelical Protestant: Arkansas (37%), West Virginia (36%), Tennessee (36%), Alabama (35%), and Kentucky (33%). Additionally, Mormons (51%) are the largest religious group in Utah, one of the most religiously homogeneous states in the country. White mainline Protestants are more numerous in North Dakota than any other state, making up 30% of the state’s residents. Black Protestants are most dominant in Mississippi, where they make up one-quarter (25%) of the population, but they are still only the second largest religious group in the state behind white evangelical Protestants (31%). Despite the incredible variety of religious expression and identity in the U.S., there are importance differences in the degree of religious diversity found in each state. To measure the religious diversity in the country, this report uses an index developed to measure variations in the concentration of global religious populations.2 The index is calculated so that a score of “one” signifies complete diversity—every religious group is of equal size—while a score of “zero” indicates a complete lack of diversity and one religious group comprises the entire population of a given state. The least religiously diverse states in the U.S. are all located in the South. Mississippi is the least diverse state in the U.S. (0.45), followed by Alabama (0.48), Arkansas (0.49), South Carolina (0.53), and Tennessee (0.53). 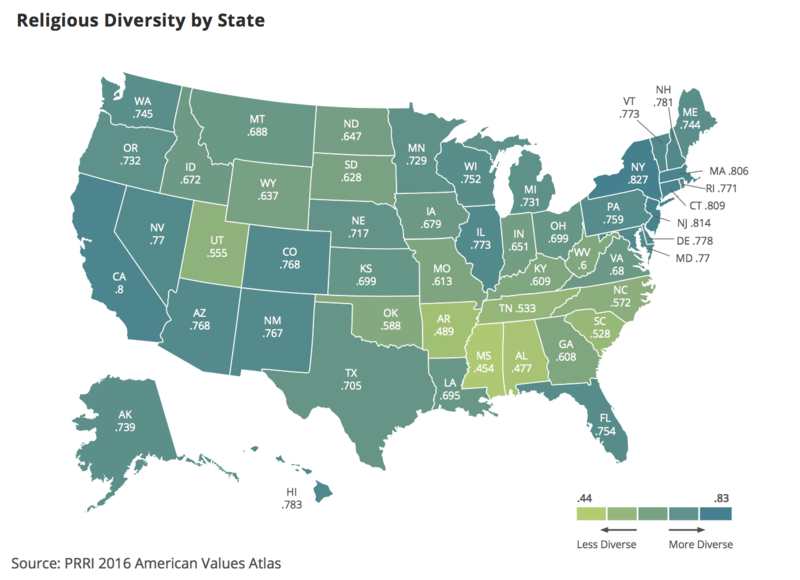 Conversely, the most religiously diverse states are primarily located in the Northeastern U.S., with New York (0.83), New Jersey (0.81), Connecticut (0.81), Massachusetts (0.81), and California (0.8) registering the greatest degree of religious diversity. 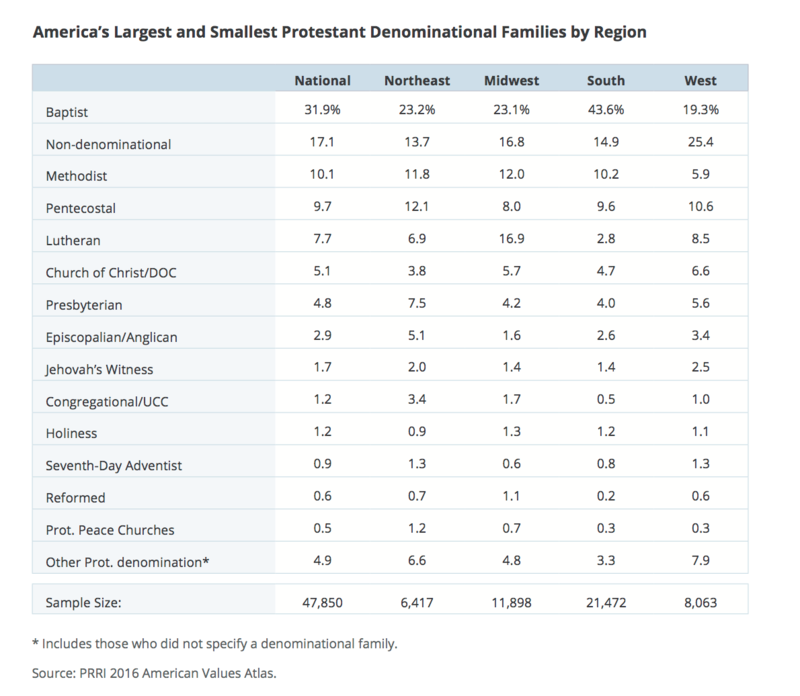 Among Protestants in the U.S., Baptists are the largest denominational family. Roughly one-third (32%) of all Protestants identify with some Baptist denomination, at least three times the number who identify with the next largest denominational families—Methodist (10%), Pentecostal (10%), and Lutheran (8%). One in twenty identify with the Church of Christ or Disciples of Christ (5%) denominations or with the Presbyterian denomination (5%). Only three percent of Protestants belong to an Episcopalian or Anglican denomination. Notably, nearly one in five (17%) Protestants belong to independent Christian churches that are not affiliated with any Protestant denomination. The pattern of denominational membership among Protestants varies significantly by region. More than four in ten (44%) Protestants living in the South affiliate with a Baptist denomination, nearly twice as many as those living in the Northeast (23%), Midwest (23%), or West (19%). Lutherans remain much more prevalent in the Midwest than any other part of the country. Seventeen percent of Protestants living in the Midwest are Lutheran, roughly twice the number who identify with this denomination in the West (9%) and the Northeast (7%). Only three percent of Southerners are Lutheran. Non-denominational Protestants are more prevalent in the West (25%) than the Midwest (17%), South (15%), or Northeast (14%). Certain states are also unique in that they are dominated by one denominational family. A majority of Protestants in Mississippi (60%), Arkansas (56%), Louisiana (55%), and Alabama (54%) are Baptist, while a majority of Protestants in North Dakota (56%) and nearly half of those in Minnesota (49%) are Lutheran. Overall, 1.5% of Americans identify as Jewish when responding to a question about their religious affiliation. However, previous research has suggested questions that frame Jewish identity in explicitly religious terms may undercount the total Jewish population because they miss those with a cultural or familial affinity. To address this issue, the survey included a question to identify those who had a cultural rather than a religious connection to their Jewish identity.3 An additional 0.8% of Americans identify as culturally but not religiously Jewish. The issue of Jewish cultural identity has become increasingly important as younger Jews are more likely to have a cultural affinity. Among Jews under the age of 30, fewer than half (47%) identify as religiously Jewish, while a majority (53%) identify as culturally Jewish. In sharp contrast, more than three-quarters (78%) of Jewish seniors (age 65 or older) are religiously Jewish, while 22% identify as culturally Jewish. Among all Jewish Americans—those who identify as Jewish both religiously and culturally—more identify as Reform than any other denomination. Twenty-eight percent of Jews identify as Reform, compared to 14% who identify as Conservative and 10% who identify as Orthodox. Two percent identify as Reconstructionist. Notably, more than one-third (37%) of Jewish Americans claim to be “just Jewish” when asked about their denominational affiliation. There is, however, a considerable disparity in denominational membership among Jews by age. Only 20% of Jews under the age of 30 are Reform, compared to 15% who identify as Orthodox. Fewer than one in ten (8%) young Jewish Americans affiliate with the Conservative movement, and three percent identify as Reconstructionist. More than four in ten (44%) say they are “just Jewish” in terms of their denominational affinity. Jewish seniors are about ten times as likely to identify as Reform as they are to identify as Orthodox (35% vs. 3%, respectively). One in five (20%) identify as Conservative, and two percent identify as Reconstructionist. Approximately one-third (34%) do not claim any denominational affiliation. Self-identified evangelical Protestants account for more than one-quarter (26%) of the public, but whites make up only a subset of this larger group. Fewer than two-thirds (64%) of all evangelical Protestants are white. Nearly one in five (19%) are black, one in ten (10%) are Hispanic, and six percent identify as some other race or mixed race. Thus, among the public overall, white evangelical Protestants account for fewer than one in five (17%) Americans. Five percent of Americans are black evangelical Protestants, two percent are Hispanic evangelical Protestants, and other or mixed-race evangelical Protestants make up one percent of the public. Like all Christians in the U.S., evangelical Protestants are experiencing a substantial racial and ethnic transformation. Young evangelical Protestants are far more racially and ethnically diverse than previous generations. Only half (50%) of evangelical Protestants under the age of 30 are white, compared to more than three-quarters (77%) of evangelical Protestant seniors (age 65 or older). Twenty-two percent of young evangelical Protestants are black, 18% are Hispanic, and nine percent identify as some other race or mixed race. Demographically, the U.S. historically has been an overwhelmingly white Christian country, with white Protestants alone constituting a clear cultural majority.6 In 1976, roughly eight in ten (81%) Americans identified as white and identified with a Christian denomination. At that time, a majority (55%) of Americans were white Protestants. Much of the decline has occurred in the last few decades. As recently as 1996, white Christians still made up nearly two-thirds (65%) of the public. By 2006, that number dropped to 54%, but white Christians still constituted a majority.8 But over the last decade, the proportion of white Christians in the U.S. has slipped below majority. Today, only 43% of Americans identify as white and Christian—and only 30% as white and Protestant. Although white Christians have experienced substantial losses nationally, there are notable divisions in the size of the white Christian population by state. Today, the states with the highest concentrations of white Christians are generally found in the Midwest and Appalachia, including North Dakota (71%), South Dakota (68%), Iowa (64%), West Virginia (61%), Kentucky (61%), Utah (61%), Minnesota (59%), Missouri (58%), and Arkansas (58%). Conversely, white Christians are least plentiful in Hawaii (20%), California (24%), New York (30%), New Mexico (30%), and Maryland (32%). 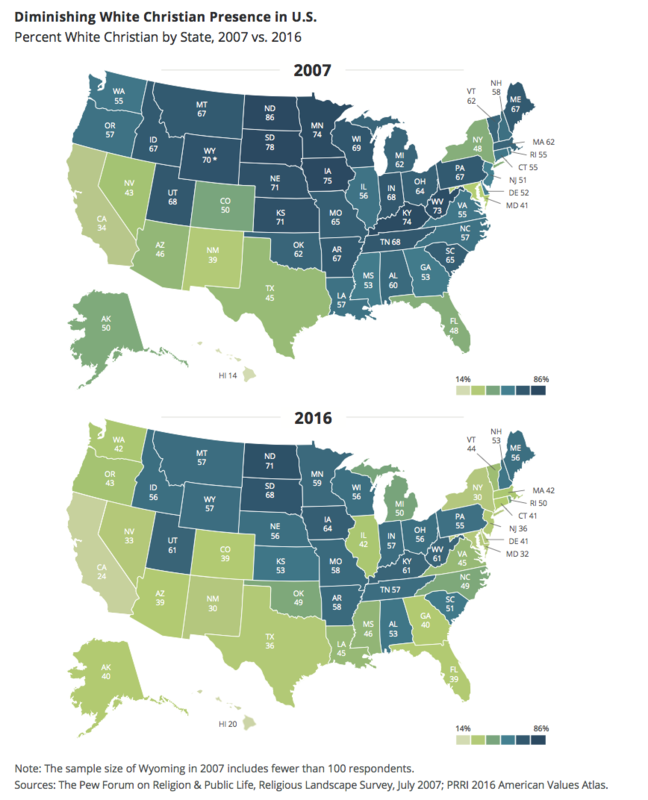 Notably, between 2007 and 2016, the proportions of white Christians have declined in every state but one (Hawaii), though the amount of decline varies widely by state. Many of the states that experienced the greatest losses are concentrated in the Northeast. Massachusetts, for example, experienced a 20-point decline in the number of white Christians living in the state over the last decade. Hawaii, the only state to experience an increase in the proportion of white Christians, saw an increase of six percentage points. White evangelicals managed to avoid the first wave of white Christian decline in the 1990s and into the early years of the 21st century. But between 2006 and 2016, the proportion of white evangelical Protestants has fallen six percentage points, from 23% to 17%. White Catholics experienced a similar decline in membership, dropping five percentage points from 16% in 2006 to 11% in 2016.11 White mainline Protestants also experienced significant losses during this period, dropping from 18% in 2006 to 13% in 2016. White Christians are not only declining, they are aging. Only slightly more than one in ten white evangelical Protestants (11%), white Catholics (11%), and white mainline Protestants (14%) are under the age of 30. Approximately six in ten white evangelical Protestants (62%), white Catholics (62%), and white mainline Protestants (59%) are at least 50 years old. No religious group has older members than white evangelical Protestants and white Catholics. The median age of white evangelical Protestants and white Catholics is 55 years old, slightly higher than white mainline Protestants at 54 years old. Unitarian-Universalists are also much older than members of other religious groups: The median age is 54 years. In contrast, about one in three Hispanic Protestants (32%), religiously unaffiliated Americans (34%), Buddhists (35%), and Hindus (36%) are under the age of 30. More than four in ten (42%) Muslim Americans are under the age of 30. The median ages of Hindus (32 years), Muslims (32 years), Buddhists (36 years), religiously unaffiliated Americans (37 years), and Hispanic Protestants (37 years) are below 40. Mormons are also much younger than other white Christian religious traditions. Nearly one-quarter (23%) of Mormons are under the age of 30. Fewer than half (41%) are age 50 or older. Today, three in ten (30%) Americans are white Protestant. This is a considerable decline over the past couple of decades; in 1991, white Protestants represented half (50%) the public.15 Not only have white Protestants experienced a substantial decline as a proportion of the general population, they also represent a shrinking proportion of all Protestants. In 1991, 83% of all Protestants were white, compared to two-thirds (67%) today. One-third (33%) of all Protestants are now nonwhite. However, the degree of racial and ethnic diversity among Protestants varies considerably between denominational families. More than nine in ten Lutherans (92%) and roughly eight in ten Methodists (83%), Presbyterians (83%), and Episcopalians (80%) are white, non-Hispanic. In contrast, fewer than six in ten (58%) Baptists are white, and a sizeable share of members are black (30%) or Hispanic (5%). Similarly, only half (50%) of Pentecostals are white, while one-quarter (25%) are Hispanic, and 17% are black. Protestants who belong to non-denominational Protestant churches are also somewhat diverse: Two-thirds (67%) are white, 13% are black, and 10% are Hispanic. For most of the past 25 years, American Catholics have been overwhelmingly white. In 1991, more than eight in ten (87%) U.S. Catholics were white, non-Hispanic.16 Today, 55% of Catholics identify as white, non-Hispanic, and more than one-third (36%) are Hispanic. Notably, much of the shift in the ethnic composition of the American Catholic community occurred over just the last couple of decades. Generational differences in the ethnic and racial make-up of American Catholics also suggest that a substantial cultural shift is underway. Fewer than four in ten (36%) Catholics under the age of 30 are white, non-Hispanic, compared to a majority (52%) who are Hispanic. In contrast, more than three-quarters (76%) of Catholic seniors (age 65 or older) are white, while only 17% are Hispanic. Demographic differences between Hispanic and white Catholics also suggest that the Hispanic Catholic community is poised to make further gains. First, Hispanic Catholics are nearly twice as likely as white Catholics to be parents of children under the age of 18 (30% vs. 16%, respectively). The discrepancy in parental status is driven largely by age differences between Hispanic Catholics and white Catholics. Second, Hispanic Catholics are more likely to have larger families: Close to three in ten (28%) Hispanic Catholic parents have at least three children under the age of 18 living at home, while 21% of white Catholic families report the same. Historically, the U.S. Catholic Church was centered in the Northeast, where European immigrants from predominantly Catholic countries, such as Italy and Ireland, first settled. Even today, Catholics represent a disproportionate size of the population in many states in the region, including Rhode Island (41%), Massachusetts (34%), New Jersey (34%), Connecticut (31%), and New York (31%). However, due to recent patterns of immigration from predominantly Catholic countries in Latin America, particularly Mexico, the Catholic population is experiencing growth across the Southwest. In 1972, roughly seven in ten Catholics lived in either the Northeast (41%) or the Midwest (28%).17 Only about one-third of Catholics lived in the South (13%) or West (18%). Today, a majority of Catholics now reside in the South (29%) or West (25%). Currently, only about one-quarter (26%) of the U.S. Catholic population lives in the Northeast. Regional age differences among Catholics also indicate that Catholicism’s center of gravity is shifting. American Catholics residing in the Northeast and Midwest are substantially older than Catholics in the Southwestern United States. Fewer than half of Catholics in the Northeast (47%) and Midwest (44%) are less than 50 years of age. In contrast, a majority (58%) of Catholics living in the Western U.S. are under the age of 50. The religiously unaffiliated—those who identify as “atheist,” “agnostic,” or “nothing in particular”—now account for nearly one-quarter (24%) of Americans. Since the early 1990s, this group has roughly tripled in size. Religious identity is highly stratified by age, with younger Americans (age 18-29) most likely to be religiously unaffiliated and seniors (age 65 or older) least likely to identify this way. However, the relationship between age and unaffiliated status is not completely linear. While there is considerable variation at the youngest and oldest ends of the age spectrum, there is less variation in the rate of unaffiliated identity among Americans in their 40s (23%), 50s (18%), and 60s (16%). Although unaffiliated Americans tend to be younger than religiously affiliated Americans on average, the group collectively is older today than it was a generation ago. Today, about one-third (34%) of unaffiliated Americans are under the age of 30, while nearly three in ten (29%) are at least 50 years old. 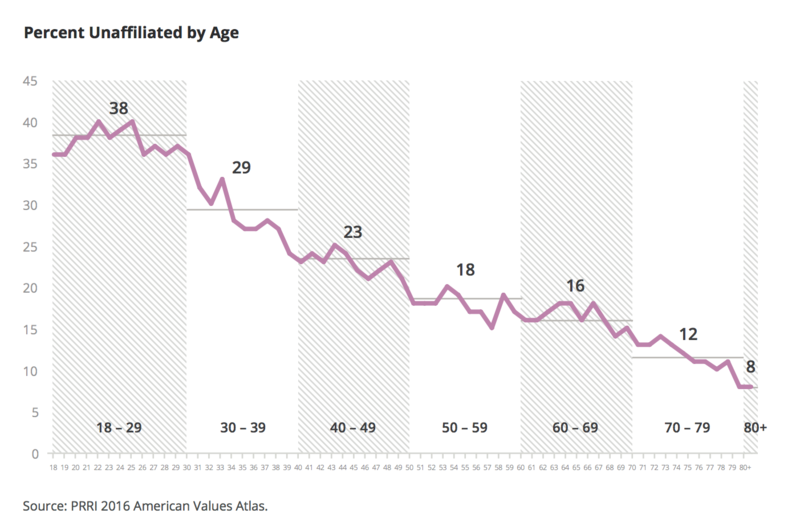 In the 1970s, half (50%) of all unaffiliated Americans were under 30 years old, and only 17% were age 50 or older. The median age of someone who was unaffiliated during that decade was also seven years younger than it is today: 29 vs. 36, respectively. Younger unaffiliated Americans are only somewhat more likely than unaffiliated seniors to identify as atheist or agnostic (31% vs. 24%, respectively), while unaffiliated seniors are twice as likely as younger unaffiliated Americans to identify as a religious person (20% vs. 10%, respectively). A majority of unaffiliated young adults and seniors say they are secular (59% vs. 56%, respectively). Women continue to make up the majority of most religious groups—including most Christian groups. A majority of black Protestants (58%), white evangelical Protestants (56%), Hispanic Catholics (55%), white mainline Protestants (54%), white Catholics (53%), and Hispanic Protestants (53%) are women. Among Mormons and Jewish Americans, the gender split mirrors that of the general public—48% male, 52% female—while the gender divide among Buddhists and Orthodox Christians is exactly even (50% male, 50% female). Men make up a majority of religiously unaffiliated Americans (55%), Muslims (59%), and Hindus (66%). Fewer than half of unaffiliated Americans (45%), Muslims (41%), and Hindus (34%) are women. Atheists and agnostics are more heavily male-dominated than the unaffiliated overall: Men account for 64% of atheists and 63% of agnostics. The gender imbalance is also quite prominent among Unitarian Universalists, among whom nearly two-thirds (64%) are women. Only 36% are men. Levels of educational attainment vary widely between religious groups, even among white Christians. Unitarian-Universalists and Hindus are, on average, the most educated, while Hispanic Catholics are the least formally educated. Close to half (48%) of white evangelical Protestants have a high school education or less, compared to fewer than four in ten white mainline Protestants (38%), white Catholics (37%), and Mormons (34%). Roughly one-third of Mormons (32%) and more than one-third of white mainline Protestants (36%) and white Catholics (39%) have a four-year college degree, compared to only one-quarter (25%) of white evangelical Protestants. Among Protestants, there are substantial variations by denominational family. Presbyterians and Episcopalians have the highest levels of educational attainment. Roughly half of Presbyterians (48%) and Episcopalians (52%) have at least a four-year college degree. In contrast, significantly fewer Methodists (36%), Lutherans (34%), Baptists (19%), and Pentecostals (15%) graduated from a four-year college or university. A majority (55%) of Baptists and six in ten (60%) Pentecostals have no more than a high school education. Nearly half (49%) of Catholics have a high school education or less, while more than one in five (21%) have some college education, and 29% report having at least a four-year college degree. However, levels of educational attainment vary considerably by ethnicity. Seven in ten (70%) Hispanic Catholics have a high school education or less, compared to 37% of white Catholics. White Catholics are about three times as likely as Hispanic Catholics to have at least a four-year college degree (39% vs. 12%, respectively). Nonwhite Christian religious groups have considerably lower levels of education. A majority of black Protestants (52%), Hispanic Protestants (65%), and Hispanic Catholics (70%) report having a high school education or less. Fewer than one-quarter of black Protestants (22%), Hispanic Protestants (14%), and Hispanic Catholics (12%) have a college degree. Among non-Christian religious groups, Muslims have the lowest levels of educational attainment. More than four in ten (44%) Muslims have a high school degree or less, compared to 37% of Buddhists and about one in five Jews (22%) and Hindus (19%). Jewish and Hindu Americans are highly educated; strong majorities have a four-year college degree (61% vs. 69%, respectively), including more than one-third of each group who have post-graduate degrees (34% vs. 38% respectively). However, among Jewish Americans, there are considerable differences in educational background by denomination. Orthodox Jews are far more likely than Reform Jews to have no more than a high school education (44% vs. 14%, respectively). No religious group has a higher proportion of members with post-graduate degrees than Unitarian-Universalists. Nearly two-thirds (65%) have a college education, including more than four in ten (43%) who have an advanced degree. Religiously unaffiliated Americans are less educated than many religious groups. More than four in ten (44%) have a high school education or less. One-quarter (25%) have some college experience, such as an associate’s degree, and roughly three in ten (31%) have a four-year college education. However, self-identified atheists and agnostics have significantly greater educational experience. About one-third of atheists (34%) and agnostics (31%) have no more than a high school education, while 42% of each group have at least a four-year college degree. Religious groups with the lowest levels of household incomes tend be Christians from racial and ethnic minority groups. More than four in ten black Protestants (43%), Hispanic Protestants (45%), Jehovah’s Witnesses (45%), and Hispanic Catholics (49%) report household earnings of less than $30,000 per year. White Christian groups report higher levels of income. Fewer than one-third of white evangelical Protestants (28%), Mormons (26%), white mainline Protestants (22%), and white Catholics (19%) have household incomes of less than $30,000 per year. Among non-Christian groups, Muslims report the lowest levels of household income. Nearly four in ten (38%) Muslims have household incomes of less than $30,000 per year, compared to fewer than one-third of Buddhists (31%), Hindus (20%), and Jews (16%). One-quarter (25%) of Hindus and 30% of Jewish Americans have annual household incomes in excess of $100,000. Unitarians-Universalists are also fairly well off financially. Only 18% report living in households making less than $30,000 annually, and 22% report having incomes exceeding $100,000. The income levels of religiously unaffiliated Americans closely mirror Americans overall. Patterns of homeownership vary considerably among religious groups. Roughly three-quarters of white Catholics (78%), white evangelical Protestants (75%), and white mainline Protestants (75%) report they own their home. About two-thirds (66%) of Mormons say they own rather than rent. Nonwhite Christians are far less likely to report owning their home. Fewer than half of Jehovah’s Witnesses (48%), black Protestants (46%), Hispanic Catholics (38%), and Hispanic Protestants (38%) are homeowners. Among non-Christian groups, Jewish Americans (69%) are much more likely than Buddhists (54%), Muslims (36%), or Hindus (31%) to own their home. More than seven in ten (72%) Unitarian-Universalists own their home. A majority (54%) of religiously unaffiliated Americans are homeowners. A slim majority (51%) of white Catholics and close to half of Mormons (48%) and white mainline Protestants (46%) report they receive health insurance through their employer. More than four in ten (43%) white evangelical Protestants say they have employer-based health insurance. Three in ten (30%) white evangelical Protestants have government-sponsored health care such as Medicare or Medicaid, while fewer white mainline Protestants (27%), white Catholics (25%), and Mormons (22%) report the same. Nonwhite Christians are much less likely to have employer-based health insurance than white Christians, but there are notable differences in patterns of coverage among these groups. About one-third of black Protestants (35%), Hispanic Protestants (31%), Jehovah’s Witnesses (31%), and Hispanic Catholics (29%) report having health insurance through their employer. Jehovah’s Witnesses (33%) and black Protestants (30%) are more likely to receive health insurance through government programs than Hispanic Protestants (21%) and Hispanic Catholics (23%). But nearly one-third of Hispanic Protestants (29%) and Hispanic Catholics (32%) report they have no health insurance coverage at all. No group is more likely to receive health insurance through their employer than Hindus. More than six in ten (62%) Hindus have employer-sponsored health care coverage. Fewer than half (47%) of Jewish Americans, four in ten (40%) Buddhists, and nearly three in ten (29%) Muslims receive health insurance through an employer. Hindus are also far less likely to receive health care through government programs, such as Medicare or Medicaid, with only six percent reporting they receive this type of coverage. In contrast, at least one in five Buddhists (21%), Muslims (25%), and Jews (25%) have government-sponsored health insurance. Nearly one in five (19%) Muslims report having no health insurance coverage. The health care insurance status of religiously unaffiliated Americans closely resembles that of Americans overall. Four in ten (43%) receive it through an employer, while 19% report receiving it through the government. Fifteen percent have no health insurance. Approximately four in ten (43%) Unitarian-Universalists also receive their health insurance through an employer, while close to one-third (29%) have government-sponsored coverage. Only four percent of Unitarian-Universalists report having no health insurance at all. The patterns of religious identity among major racial and ethnic groups are quite distinct. Nearly seven in ten (68%) white Americans are Christian and nearly half (47%) are Protestant. Twenty-seven percent of whites are evangelical Protestant, while 20% are mainline Protestant. An additional 18% of whites are Catholic. One-quarter (25%) of all whites are religiously unaffiliated. Black Americans are also predominantly Christian. Three-quarters (75%) of black Americans are Christian, although a much greater proportion are Protestant (67%), and only six percent identify as Catholic. Roughly one in five (19%) black Americans are religiously unaffiliated. Hispanic Americans are also predominantly Christian, although they are about twice as likely to identify as Catholic (48%) than Protestant (25%). One in five (20%) Hispanics are unaffiliated. Unlike other racial and ethnic groups, fewer than one in three (30%) Asian and Pacific Islander (API) Americans are Christian, with roughly equal numbers identifying as Protestant (16%) and Catholic (13%). More than one-third (34%) of API Americans are religiously unaffiliated, with significant numbers identifying as members of non-Christian traditions, such as Hindu (15%), Buddhist (7%), or Muslim (7%). Divisions in marital status among American religious communities largely occur along racial lines. At least six in ten white mainline Protestants (60%), white Catholics (61%), white evangelical Protestants (64%), and Mormons (68%) are married. In contrast, members of nonwhite religious traditions are much less likely to be married. Only 37% of black Protestants, 45% of Hispanic Protestants, and half (50%) of Hispanic Catholics report being married. Notably, among non-Christian groups, Hindus (66%) are far more likely than Muslims (49%) and Buddhists (35%) to be married. More than six in ten (62%) Jewish Americans also report being married, although there are some differences by denomination. Nearly three-quarters (74%) of Orthodox Jews are married, compared to about six in ten who belong to Conservative (64%) and Reform (59%) denominations. Roughly four in ten (42%) religiously unaffiliated Americans are married. White Christians stand out in that they do not have young children living at home. Nearly three-quarters of white evangelical Protestants (73%), white mainline Protestants (73%), and white Catholics (75%) do not have children under the age of 18 living at home. Roughly seven in ten Jews (71%) and Buddhists (72%), and approximately two-thirds of religiously unaffiliated Americans (68%), black Protestants (67%), and Hindus (67%), also report that they have no children living in their household. In contrast, only about half (50%) of Hispanic Catholics and Hispanic Protestants (52%) have no children in their households. Among Americans who report living with children in their household, Mormons have by far the largest families. More than four in ten (42%) Mormon parents say they have at least three children in their household under the age of 18. Only 28% of Mormons living with children report having only one child. By comparison, fewer than one-quarter of white evangelical Protestants (24%), white mainline Protestants (23%), and white Catholics (21%) with children say they have at least three kids in their household. Nearly three in ten (29%) Jewish parents report having at least three children in their household, although family size varies dramatically by denomination. More than six in ten (62%) Orthodox Jewish parents say they have at least three children living in their household, compared to 17% of Jewish parents who identify as Reform who say the same. Hindus have some of the smallest families. A majority (55%) of Hindus with children say they have only one child in their household, while only four percent say they have three or more. Muslim families are larger, with more than one-quarter (26%) of those with children in their household reporting three or more. LGBT Americans are far less likely to identify with any religious group than the public as a whole. Nearly half (46%) of Americans who identify as lesbian, gay, bisexual, or transgender (LGBT) are religiously unaffiliated. Fewer identify as Christian. Only six percent of LGBT Americans are white evangelical Protestant, while similar numbers identify as white mainline Protestant (8%) and white Catholic (6%). Fewer than one in ten identify as black Protestant (6%), Hispanic Catholic (5%), or Hispanic Protestant (3%). LGBT Americans are somewhat overrepresented among non-Christian religions. Six percent identify as Jewish (2%), Buddhist (2%), Muslim (1%), or Hindu (1%). There are stark generational differences among LGBT Americans in their religious identity. A majority (56%) of LGBT young adults (age 18 to 29) are religiously unaffiliated, compared to one-quarter (25%) of LGBT seniors (age 65 or older). There are no significant gender differences in the religious profile of LGBT people. Notably, Buddhists and Unitarian-Universalists have a much higher proportion of LGBT members than other religious traditions. One in seven Buddhists (14%) and Unitarian-Universalists (14%) identify as LGBT. No religious group is more closely tied to the Republican Party than white evangelical Protestants. Nearly half (49%) of white evangelical Protestants identify as Republican, about one-third (31%) are independent, and just 14% are Democratic. Mormons also lean heavily Republican, with more than four in ten (44%) identifying with the GOP, compared to 12% who are Democrats. White mainline Protestants (34% Republican, 26% Democrat) and white Catholics (34% Republican, 26% Democrat) also lean more toward the Republican Party. Notably, older white Christians are generally more likely to be affiliated with the Democratic Party than those who are younger. White evangelical Protestant seniors are about twice as likely as those under the age of 30 to identify as Democrat (18% vs. 10%, respectively); they are about equally as likely to identify as Republican (49% vs. 47%, respectively). Similarly, while nearly one-third (31%) of white Catholic seniors are Democrats, only about one in five (21%) white Catholic young adults identify as the same. The generational gap is slightly smaller among white mainline Protestants: Twenty-eight percent of seniors, compared to 21% of young adults, are affiliated with the Democratic Party. Nonwhite Christians tend to lean more toward the Democratic Party, although there is significant diversity in the partisan preferences of these groups. No religious group more strongly identifies with the Democratic Party than black Protestants. More than two-thirds (68%) of black Protestants identify as Democrats, compared to only four percent who identify as Republican. Hispanic Catholics are more than four times as likely to identify as Democrat than they are to identify as Republican (40% vs. 9%, respectively). Hispanic Protestants also lean Democratic in their political preferences, although by a more modest margin (30% vs. 17%, respectively). More than four in ten (41%) Hispanic Protestants are independent. Importantly, there are substantial generational differences in partisan identity among black Protestants and Hispanic Catholics. Black Protestant seniors are far more likely to identify as Democratic than young black Protestants (79% vs. 58%, respectively). A majority (56%) of Hispanic Catholic seniors identify as Democratic, while only about one-third (35%) of young Hispanic Catholics identify as the same. The pattern of partisan attachment is also lopsided in favor of Democratic identity among non-Christian religious groups. Nearly half of Jewish (47%) and Muslim Americans (46%) identify as Democratic, while far fewer identify as Republican (20% vs. 6%, respectively). Buddhists (37% Democrat, 9% Republican) and Hindus (36% Democrat, 9% Republican) also show far more affinity for the Democratic Party. However, four in ten (40%) Hindus and nearly half (47%) of Buddhists are independent. Among Jewish Americans, partisan attachments vary considerably by denominational affiliation. Roughly six in ten (59%) Reform Jews and 47% of Conservative Jews identify as Democrats, compared to only 23% of Orthodox Jews. Nearly four in ten (38%) Orthodox Jews identify as Republican, and 29% identify as independent. Religiously unaffiliated Americans are also more likely to identify as independent (47%) than they are to identify as Democratic (33%) or Republican (11%) combined. Among religiously unaffiliated subgroups, atheists are more Democratic leaning, with more than four in ten (44%) identifying as Democrat. No religious group is less likely to identify as Republican than Unitarian-Universalists. Only three percent of Unitarian-Universalists are Republican. A majority (57%) identify as Democrat, and one-third (33%) are independent. Also notable are the unique profile of Jehovah’s Witnesses. Reflecting their historical theological commitment to political neutrality, more than half (51%) of Jehovah’s Witnesses either refused to answer the question about partisan identity or responded by saying they didn’t know. The religious coalitions of the Democratic and Republican Parties are drifting further apart. In 2006, more than eight in ten (81%) Republicans identified as white Christian, including white evangelical Protestant (37%), white mainline Protestant (22%), and white Catholic (20%). Half (50%) of the members of the Democratic Party also identified as white Christian, including white evangelical Protestant (17%), white mainline Protestant (16%), or white Catholic (16%). Today, roughly three-quarters (73%) of the Republican Party is white Christian, but fewer than one-third (29%) of the Democratic Party identifies this way. Still, both political parties are being impacted by the larger tectonic changes in the religious landscape. These changes can be seen clearly in the generational profiles within each party. More than eight in ten (84%) Republican seniors (age 65 or older) identify as white Christian, including 42% who are white evangelical Protestant. Significantly fewer (57%) young Republicans (age 18-29) are white Christian, and only about one-quarter (24%) are white evangelical Protestant. Young Republicans are also three times more likely than seniors to be religiously unaffiliated (19% vs. 6%, respectively). The Democratic coalition is also shedding white Christian members, who are fast becoming a minor constituency within the party. Among Democratic seniors, close to half identify as white Christian, including white evangelical Protestants (15%), white mainline Protestants (17%), or white Catholics (15%). Only 15% of Democratic seniors are religiously unaffiliated. By contrast, white Christians make up only 14% of young Democrats, including white evangelical Protestants (3%), white mainline Protestants (6%), or white Catholics (4%). Among young Democrats, black Protestants (14%) and Hispanic Catholics (10%) rival the number of white Christians in the group. A whopping 40% of young Democrats are religiously unaffiliated. White evangelical Protestants and Mormons are the most conservative religious groups in the country. More than six in ten (62%) white evangelical Protestants and a majority (57%) of Mormons identify as politically conservative. Liberals make up only 12% and 15%, respectively, of these religious traditions. White mainline Protestants also lean more conservative than liberal (38% vs. 25%, respectively), while white Catholics are about twice as likely to identify as conservative than liberal (42% vs. 22%, respectively). There is wide variation in the political ideology of nonwhite Christian groups. Despite their strong Democratic leanings, black Protestants are about as likely to be conservative (30%) as they are to be liberal (29%). Similarly, Hispanic Catholics are about equally as likely to identify as conservative (33%) and liberal (29%). Hispanic Protestants are much more likely to be conservative than they are to be liberal (41% vs. 23%, respectively). Non-Christian communities are more liberal leaning. Close to half of Jews (45%), Buddhists (48%), and Hindus (45%) identify as liberal; significantly fewer Jews (27%), Buddhists (17%), and Hindus (16%) identify as conservative. Muslims are also more likely to identify as liberal (38%) than they are to identify as conservative (20%). Religiously unaffiliated Americans also lean liberal in their politics. More than four in ten (43%) identify as liberal, while 21% are conservative. No religious group is as politically progressive as Unitarian-Universalists. Seven in ten (70%) Unitarian-Universalists identify as liberal; only six percent are conservative. 1 In 2006, nearly one-quarter (23%) of the public identified as white evangelical Protestant, 18% were white mainline Protestant and 16% identified as white Catholic. 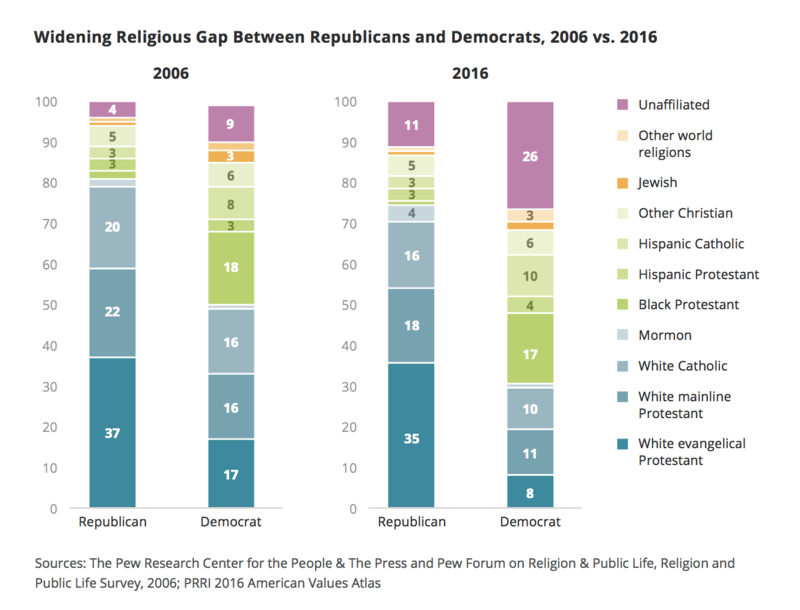 The Pew Research Center for the People & The Press and Pew Forum on Religion & Public Life, Religion and Public Life Survey, July 2006. 2 The religious diversity for each state was calculated using the Religious Diversity Index, a variant of the Herfindahl-Hirschman index, one of the most commonly used measures of diversity among human and biological populations. See Charles R. Laine. June 22, 1995. “The Herfindahl-Hirschman Index: A Concentration Measure Taking the Consumer’s Point of View.” Antitrust Bulletin. 3 To identify culturally affiliated Jews, we asked all respondents who claimed no formal religious affiliation the following question: “Do you consider yourself to be Jewish for any reason?” Any respondent who said “yes” or “half” was classified as culturally Jewish. 4 The 2015 Pew Research Center report, “America’s Changing Religious Landscape,” defines evangelical Protestants “based on the specific denomination with which they identify.” This definition departs from that employed in most other surveys because it does not take into account racial or ethnic identity. Subsequently it includes many Hispanic, Asian/Pacific Islander, and mixed-race evangelical Protestants, as well as black Protestants who do not belong to historically African American denominations. 5 All respondents who identify as Christian are then asked the following question: “Would you describe yourself as a ‘born-again’ or ‘evangelical Christian,’ or not?” Respondents who self-identify as white, non-Hispanic, Protestant and affirmatively identify as born-again or evangelical are categorized as white evangelical Protestants. 6 Throughout this report the term “white” signifies respondents who identify as white or Caucasian and who do not identify as Hispanic or Latino. 7 The General Social Survey, 1976. 8 The General Social Survey, 2006. 9 The Pew Forum on Religion & Public Life, Religious Landscape Survey, July 2007. 10 For a longer discussion of this trend and its implications, see Robert P. Jones, The End of White Christian America (Simon & Schuster, 2016). 11 The Pew Research Center for the People & The Press and Pew Forum on Religion & Public Life, Religion and Public Life Survey, July 2006. 12 General Social Survey, 1976. It was not possible to identify evangelical and mainline Protestants in the 1976 General Social Survey. 13 Eighty-three percent of Mormons are white, non-Hispanic. 14 Mormons in America: Certain in Their Beliefs, Uncertain of Their Place in Society, Pew Research Center, Jan. 12, 2012. 15 Pew Research Center for the People & the Press, Political Values Survey, 1991. 16 Pew Research Center for the People & the Press, Political Values Survey, 1991. 17 General Social Survey, 1972. Jones, Robert P., and Daniel Cox. “America’s Changing Religious Identity.” PRRI. 2017.